Folks, this lavender & honey steamer is a first — that is, it's my first drinks recipe EVER on this blog. To be honest, I'm not particularly excited about this new development. Drinks tend to be more of an afterthought for me — that is, I've never really been one to go through the elaborate process of mixing cocktails, making my own drinks recipes, etc. I tend to go for simple things that already come premade in a bottle. Sure, if you put a homemade smoothie or cocktail in front of me, I'll drink it. But will I make it for myself? Nah. I'm simply too lazy. But sugar-free month has been really hard on me, guys. 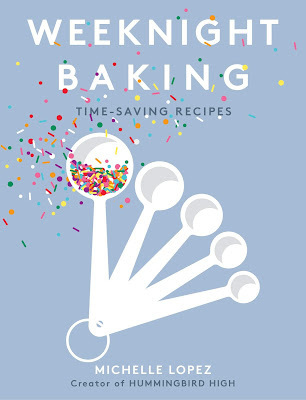 I don't look forward to baking anymore — it's a struggle to find sugar-free desserts that I'm excited about. And to be honest, these days I haven't really been craving sugar anymore (so the cravings do go away after all... at the homestretch. Who woulda thunk?). To get that foamyness, coffee shops and restaurants normally use an espresso machine with a steamer attachment, or use tools specifically for frothing milk (they work by whisking warm air bubbles into the milk, causing it to foam up). Well, I neither have an espresso machine or a milk frother. But did you know that you can make that foam without either of those tools? That is, all you really need is a small mason jar full of shaken milk and a microwave? Check out the recipe below and let me know how it works for you. 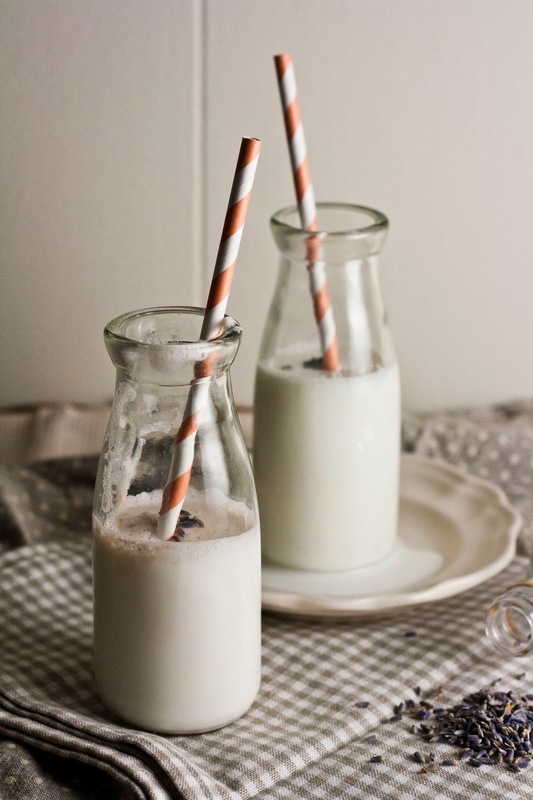 You can flavor the milk with anything — lavender, honey, tea, or even leave it plain. 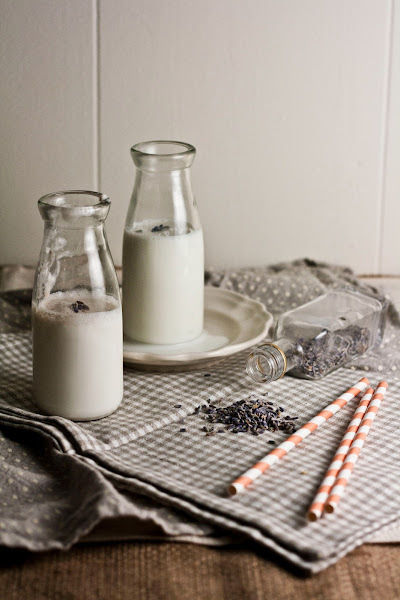 Please note that if you are infusing the milk with lavender or tea, it might be a good idea to let it infuse overnight for a stronger flavor. This is a great drink for those cold winter nights where all you want to do is watch Netflix nonstop. Like House of Cards for four hours straight. Not that I'm speaking from experience or anything. Nope. 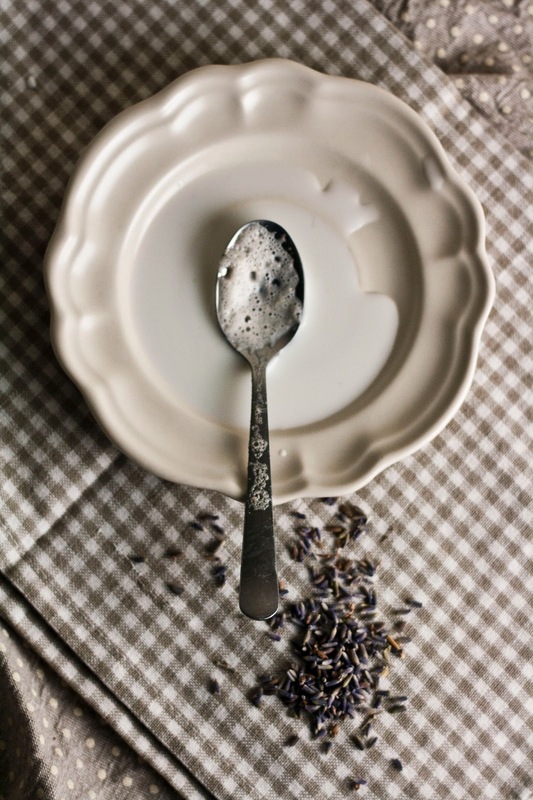 In a small bowl, combine 1 cup whole milk with 4 tablespoons of lavender. Stir the two ingredients together vigorously for few seconds before covering with plastic wrap and letting sit in the refrigerator for at least 3 hours, or preferably overnight. 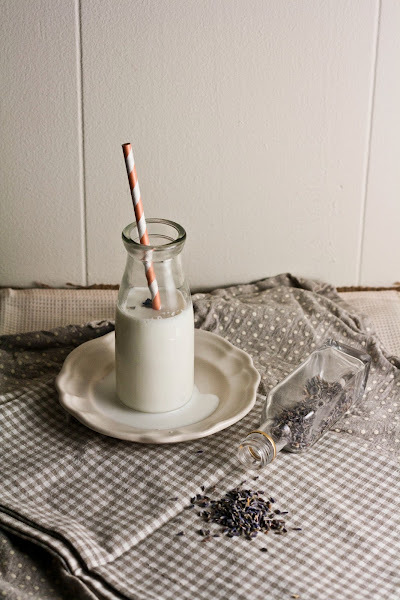 Once the milk has been infused with lavender overnight, strain the milk into a small pot. Gently heat over the stovetop until the milk is fully warmed, but making sure it doesn't boil or get too hot. Transfer the warmed milk to asmall mason jar. The milk should fill the jar no more than half way to allow room for the foam. Shake the jar with the lid on as hard as you can until the milk has become frothy and doubled in size, around 30 seconds or so. Take the lid off the jar and microwave for another 30 seconds. The foam will rise to the top of the milk and the heat from the microwave will help stabilize it. Pour the milk into your mug (or glass of choice — I used these cute milk bottles), using a spoon to hold back the foam. Don't put the foam in yet! While the milk is still warm, add 1 tablespoon of honey, stirring into the milk until well combined. Use a spoon to top off the milk and honey with the remaining foam (from the 5th step). Enjoy while hot! this is such a great recipe! Bring home the deliciousness of the coffee shop! I will have to try this - It seems easy enough! Wow, your photos are always so gorgeous! I remember having lavender honey steamers at Pied Cow in high school. It was a pretty badass thing to do, since they had hookah at the tables outside. For my sheltered high school friends and me, it always had an edge! I've been there since and it feels different now. ;) But I do remember those drinks being lovely!!! Thank you! These days, they apparently don't let anybody who's under 21 smoke hookah. Crazy right? I'm not the biggest fan of the cafe, but I do love their lavender honey steamer. Interesting! I LOVE drink recipes. This one looks great...and, what a good tip for a no-machine froth. I'm going to try this with honey and something else as I am not a huge lavender fan. I like it... but, in super low doses and usually in lemonade. ;-) But, I bet a honey cinnamon steamer would be tasty. They also have a cardamom and honey steamer at the Pied Cow that's pretty delicious. You should give that a try too? I'm also a little bit cautious around lavender since it has a tendency to taste soapy sometimes, but the cold infusion of the milk in the recipe gets rid of the bitterness and leaves a subtle taste. I love lavender and honey! I'm going to have to try this steamer recipe. I was wondering where I might find "culinary lavender?" Above you mentioned a Cardamon steamer. Have you any thoughts about how much cardamon and honey you would use? That sounds good too! I'm so glad that Pinterest brought me to your blog, about a week ago. I've read every post since then and I plan to go back and read through the rest of your blog. I love your writing style! One more thing, do you know how I can comment from my iDevice? I tried earlier today, twice, with no success. Culinary lavender is available in the bulk section of fancy grocery stores like Whole Foods. For a cardamom steamer, the amount of cardamom I would use would depend on whether I'm using cardamom pods or ground cardamom. If I were using pods and doing a cold infusion, I would use the same quantity in the lavender recipe (around 3 - 4 tablespoons), but if I were using ground I'd start with 1/4 teaspoon cardamom and go from there. With ground spices, a little goes a long way! I'd keep the honey quantities the same. Thank you, thank you, thank you so much for your compliments! I've had a lot of people drop by and say nice things, but you're the first to compliment my writing style. My parents will be glad to know that my college degree paid off, hahahaa. Not sure about commenting via an iDevice, I'll look into it tonight and get back to you. I know you can do it on iPads (I've tested it) and iPhones... was there any device in particular you were having trouble with? Omg SO true. I did Whole Living's 21-day detox mostly to rid myself of my "sugar addiction" (I just like it, okay?) and finding dessert-y, bloggable recipes became harder and harder and my sugar cravings definitely died down toward the end. I just wish I hadn't jumped right back on the sugar boat as soon as I was finished! What are your plans for after you finish your sugar-free month?? Hi Erika — why do you wish you hadn't jumped back on the sugar free boat as soon as you finished? I have a feast of brownies and donuts planned for this Friday (when my sugar-free month ends). Though I'm a bit nervous because I ate some honey and orange cake (totally sugar-free, just flavored with honey) the other day and I felt a little sick because it tasted too sweet. Did I just ruin my sugar palette for life? Hi! Sorry I hadn't thought to check back on my comment until now. Basically, I keep reading about how sugar is like a drug and I'm sure there's a lot of other negative health risks associated with eating it, but the one thing that I learned that I actually remember is that sugar can suppress your immune system. Before the detox, I was getting sick (minor colds and stuff) probably once a month-ish or I felt like I was on the verge of getting sick almost constantly. During the detox, though, I felt so much better--totally healthy. Could be a coincidence or the fact that I was eating so healthily anyway, but that's why I wish I hadn't jumped right back into eating sugar! All the work I put into changing my palette was kind of destroyed for a week when I ate crap. I'm definitely being better now because I don't want to crave really really sweet things for the rest of my life! Also, haha. That is crazy!! 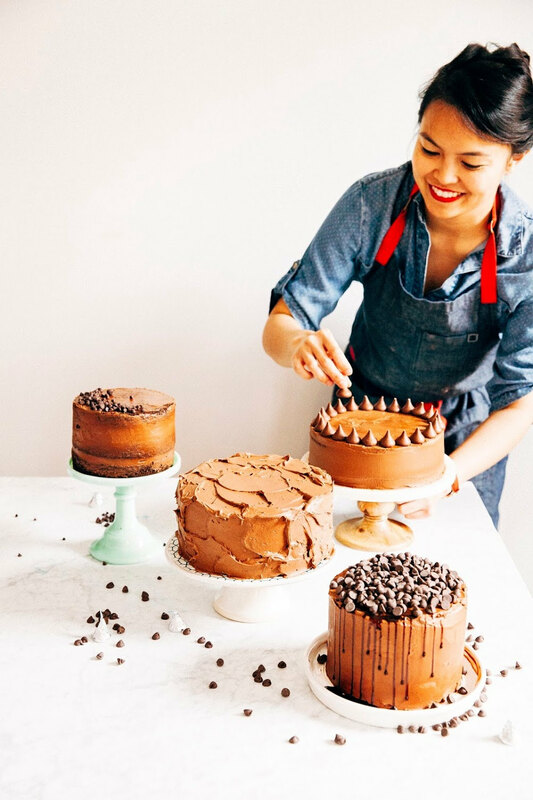 I can't believe a honey-sweetened cake was way too sweet for you! Interesting! My friend just sent me this article that was all about how big food companies are putting sugar in things that don't need sugar, so we're all secretly addicted. It sounds a little too conspiracy theory for me, but during sugar-free month, I definitely realized how much sugar there really is in other foods that don't seem to need it. I know what you mean about jumping back into sugar. I've been eating desserts since Friday, and now I'm starting to experience these weird sugar buzzes/crashes that I've never really experienced before. It could just be in my head though, hahaah. i love the pied cow! i've attempted a few times to recreate their lentil dip but have had no success. this drink is an easy copycat, though. try steeping some earl grey tea in the drink--delicious!